Dinner tonight is going to be Chicken with 40 Cloves of Garlic, frankly because I love the sound of the words “40 cloves of garlic.” Who wouldn’t? In case you had any doubt that this is a good idea, Nigella Lawson endorses this practice, as do many others, including my Aunt Rozik whose an adventurous cook. Fear not – This is indeed a good idea, despite what appears to be a barrage of garlic. Whole heads are roasted alongside the chicken which sits on top fingerling potatoes bathing below in a potion of vermouth, balsamic vinegar and lemon juice. A sprinkle of toasty pine nuts before serving adds more interest. The sweet, creamy cloves remain in their casings until they are popped out and spread like butter over crisp toasted bread. Gather the family around the table tonight. 40 is a fearsome number, especially considering something stinky, but garlic doesn’t release its trademark aroma unless the cloves are peeled, crushed and smashed. The cooking process also mellows the flavor of the beautiful bulb, making it sweeter and filling the kitchen air with an irresistible fragrance. Garlic goes into every savory dish I make, because everything is better with garlic. Here, the little cloves are left to roast right in their peels, melting into soft, sweet deliciousness. Perhaps the best part of this dish is that it requires very little use of the knife, only to slice the top of the garlic heads off. A quick sizzle before they head into the oven makes the chicken skin irresistibly crispy. The oven then does all the hard work, leaving you with ample time to help the children with their homework, followed by an obligatory break with a glass of wine. An easy, rustic dish like this does not need any showy side kicks. The fingerling potatoes, roasted garlic and a fresh crusty loaf of bread suffice, but if you feel you must offer your guests more, simple maple-glazed carrots and smoky green freekeh prove to be the perfect pairings for Chicken with 40 Cloves of Garlic. Freekeh always reminds me of the hospitality of our Syrian neighbours next door. They often include us in family gatherings and treat us to a delightful feast of Arabic classics. Wildly popular in parts of the Middle East, wheat is harvested young and roasted over an open fire. It’s a healthy and delicious alternative to rice similar to bulghur. Chicken with 40 Cloves of Garlic goes from oven to table with little effort. Dismiss your instinct to believe this is a tad bit excessive. 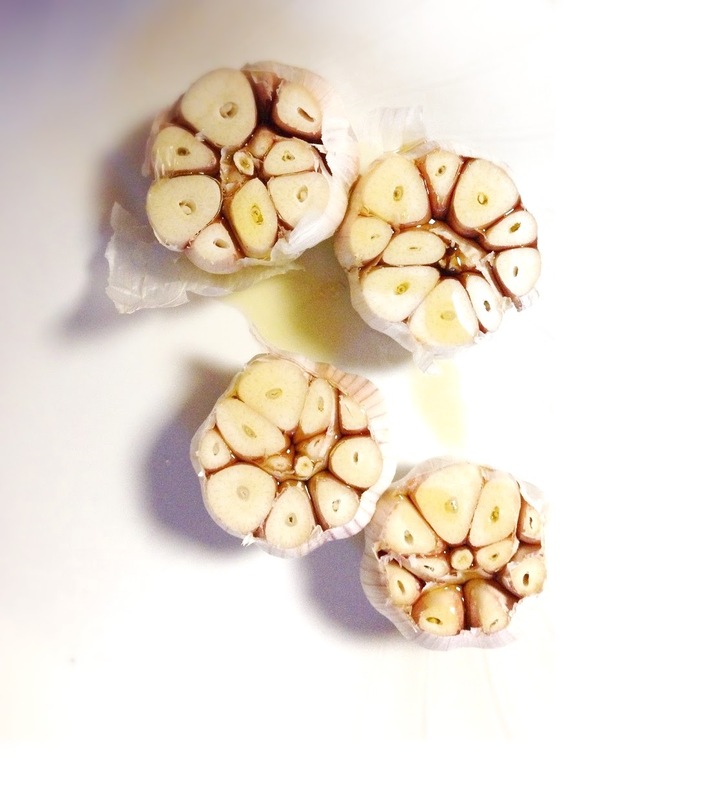 There are about 10 cloves in most heads of garlic, which amounts to the 40 cloves required here. 4 heads of garlic for 4 pounds of chicken really isn’t all that much. While it is true that most of us only keep but one head of garlic in our fridge at any time, this rendition of roast chicken is so delicious, it’ll have you dashing to the store to buy out their full stock of the stinky little vampire deterrents. Dear Colette, now this looks like a true crowd pleaser of a dish. We love roast chicken with tons of garlic and lemons and herbs and fingerling potatoes alongside – you did an amzing job with your presentation and your new blog design is charming and wonderful and fresh and all! Love it! Fabulous recipe, great pictures and a wonderful post! Somehow I missed this one. So happy I found it. I LOVE garlic chicken. LOVE! Love how cozy and comforting it looks, too.